Last December I created a flower bed for my parents' backyard and sowed native wildflower seeds (obtained from Native American Seed). The bed is in full sun most of the day, and the seeds are already starting to sprout. Do they need a shade cloth to protect them from the full sun until they get established? If so, what percent of shade would be appropriate? Most Texas native wildflower seeds as they begin to sprout, especially in the cooler weather of early Spring, need lots of sun. We are assuming that your parents' garden is also in Denton County since you didn't say otherwise. We consider "full sun" to be six hours or more of sun a day, "partial shade" two to six hours and "shade" 2 hours or less. We also don't know what wildflower mix you have, so we looked at the Online Catalog for Native American Seed. 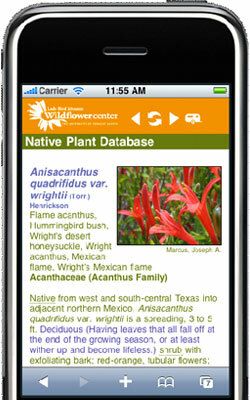 Following that link, we went to the Native Texas Wildflowers link and clicked on it. This has a small chart listing the soils in which this mix would do well as sand, loam, clay or caliche, and sunlight as full or part sun. That should pretty well cover the conditions you should have in North Central Texas, and all of the eight wildflowers on that list do grow in that section of Texas. We certainly would not recommend any kind of sunshade for those baby plants, nor over watering. Remember, if a plant is native to an area, which is all Mr. Smarty Plants ever recommends, it will tolerate the conditions that are there, because that plant has been tolerating and thriving in those conditions for thousands and thousands of years. You don't need to overlove natives - they don't particularly like or need fertilizer, they need just the normal rainfall of the area except in an exceedingly dry year, and they need sunlight to permit photosynthesis in the leaves to make food for the plant. Using a mix is a little more complicated, but Native American Seed is a very reputable provider of seed. However, if a plant in a mix fails, you may not know which seeds in that mix should be discarded and not used again, so we prefer individually selected and packed seeds. Gaillardia pulchella (Firewheel) Referred to on seed list as "Indian Blanket"
Monarda citriodora (Lemon beebalm) This is referred to as "Lemon mint" on the NAS website. Ratibida columnifera (Mexican hat)- also on this list is Prairie Coneflower, which happens to be the same family, genus and species, just a different common name. You can follow each link above to our webpage on that plant to see more information and pictures.